Ward & Associates - Introduction To Our Firm and Principle - Boston Real Estate Attorney. Eviction Law. Zoning and Variances. Housing Discrimination. We understand that the large number of attorneys in Massachusetts and the rapidly growing number of laws make choosing the right law firm a bewildering task. Our firm believes that delivering high quality service to the client, while implementing the most accommodating fee structure should be the primary goal of all law firms. It is certainly our primary goal. Please note, our firm does not represent residential tenants. Emil Ward is the founder and owner of Ward & Associates. The firm has a real estate focus. With decades of experience in real estate matters, Attorney Ward and his firm represent condominium associations, large and small owners and managers of real estate with their management issues such as, anti-discrimination issues, evictions, security deposit issues, lease drafting, post-foreclosure evictions, Building and Sanitary Code issues, partitions of property, medical marijuana issues, class action defense, and real estate-related litigation, to name a few. The firm has recently begun to offer mediation services and consultation services designed to help other lawyers and clients better triage their cases. Mr. Ward has practiced law for almost four decades. In that time, Mr. Ward has lectured in the area of landlord and tenant law, given seminars to landlords and tenants, litigated multi-million dollar commercial cases, written books and pamphlets in the area of landlord and tenant law, and lectured to groups of judges and lawyers alike. Mr. Ward has lectured on the subject of the rights and responsibilities of landlords and tenants under the new Medical Marijuana Laws. Mr. Ward has literally written the book on landlord-tenant law having published a practice manual on the subject in 1996 entitled: Massachusetts Landlord-Tenant Practice: Law and Forms. 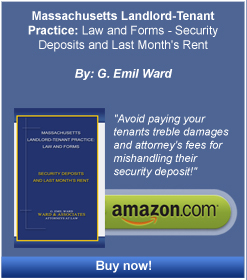 In 2011, Mr. Ward published Massachusetts Landlord-Tenant Practice: Law and Forms – Security Deposits and Last Month’s Rent. Mr. Ward has taught law at Suffolk University Law School and Boston University’s Paralegal School. Attorney Ward has testified before the Massachusetts legislature on various real estate bills. He has been a consultant to the Massachusetts Association of Realtors. He has taught their landlord and tenant courses and Mr. Ward has written pamphlets for the state of Massachusetts and for the Massachusetts Association of Realtors summarizing the rights of landlords and tenants. Mr. Ward has also been retained by insurers as an expert witness. The firm consists of Mr. Ward and several attorneys associated with the firm who are involved in real estate law and civil litigation. Firm representation extends to clients primarily in eastern Massachusetts, to mid Massachusetts. With each client Ward & Associates tries to give the best personal service of any firm in the field, because Ward & Associates knows that client satisfaction is the ultimate goal of the practice.